When I was in college, “bourbon” meant Maker’s Mark, and “rum” meant Bacardi, each mixed with Diet Coke, of course. Now that I’m a grown-up, I still enjoy Maker’s (although I have stopped desecrating it). But aside from the occasional beach-vacation Rum Runner, I got over Bacardi a long time ago, coming to the conclusion that rum was a simplistic, one-dimensional, kind of boring spirit. Until, that is, a friend introduced me to aged rum from Puerto Rico. This rum was a revelation! As soon as the bottle was opened I smelled rich flavors – brown sugar, vanilla, caramel… butterscotch? It smelled a lot, in fact, like bourbon. There’s a good reason for that. 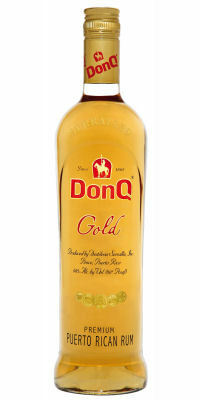 All Don Q rums are aged for at least one year in charred American white oak barrels, with the goal of producing a spirit of “rich complexity.” Don Q Gold, aged three to five years, has an appealingly thick texture and rich flavors of caramel and spice and molasses. This rum isn’t going into a daiquiri. I drink it straight, usually sipping it from a shot glass – it’s so rich that a little goes a long way. Mark Garrison wrote a nice appreciation of aged rums on Slate.com last week. Read it here.